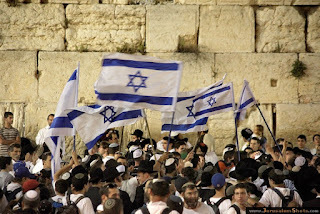 On the twenty-eighth day of the month of Iyar, we celebrate Hashem's miraculous deliverance of Israel from all of its surrounding enemies, and the conquest of its ancient Land including all of Jerusalem with the Kotel (Western Wall) in its midst. For two thousand years, we have been praying for the rebuilding of Yerushalayim, daily. In 1967, this prayer became fulfilled to a great degree. The Jewish people and our Holy City was finally reunited. After almost two thousand years of separation, it is a great zchut (merit) to witness that Jerusalem with its Holy Temple Mount is again in Jewish hands. In 1967, I lived in Denmark and was only seven years old, but I still remember the great event, because it deeply touched me. I remember the excitement and enthusiastic spirit in the air, and the television reports, which had interviews with soldiers and songs. We played Naomi Shemer's: "Yerushalayim shel Zahav" over and over. There was no doubt in anyone's mind (even the most secular) that a great miracle had taken place. All of the armies of Egypt, Jordan, Syria and Iraq, with nearly two hundred thousand troops, supplied by Russia with an arsenal of mighty weapons had arrogantly declared to the whole world: "We are set upon destroying the Jewish State and murdering its inhabitants! We shall drown them in the sea!" In spite of this, through Hashem's great miracle, the Israeli army, which was greatly outnumbered, landed a great victory. Even gentile authors wrote about this wonder which they compared to the victory of the little David against Goliath the giant. With all these feelings and excitement, we must ask ourselves about the spiritual significance of the miracles which took place in the Six Day War. 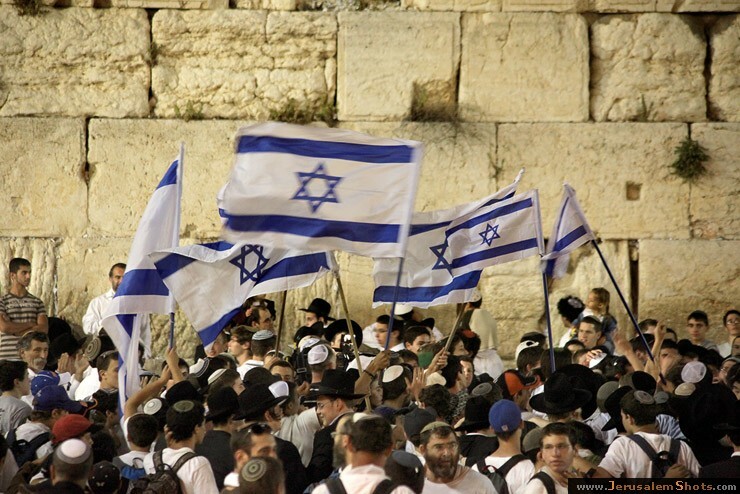 It is not incidental that both Yom Ha'atzmaut and Yom Yerushalayim fall in the period between Pesach and Shavuot. Rabbi Loevenstein the masgiach of Ponovitz Yeshiva, explains that experiencing Hashem's miracles are a preparation for receiving the Torah. It was only through recognizing the miracle of Purim that the Jewish people reached the level of accepting the Torah through love. Similarly, through recognizing the miracles that Hashem did for us on Yom Yerushalayim, which occurs on the calendar exactly a week prior to Shavuot, we become worthy of receiving the Torah. Moreover, only when the Jewish people are united in our Holy Land, can the Torah of Israel be totally revealed in the world. ספר ישעיה פרק ב פסוק ג כִּי מִּצִּיּוֹן תֵּצֵּא תוֹרָה וּדְבַר השם מִּירוּשלים. "For from Zion goes out Torah and the word of Hashem from Jerusalem." (Yesha'yahu 2:3). Rabbi Loevenstein writes in his diary: "The first thing at this time is to realize that what happened (in the Six Day War) is the hand of Hashem and not by chance. We should know that our entire fate is in His hand. No other cause has any influence. Everything is hasgacha pratit, and therefore we must trust in Hashem." These words reflect the message of our haftorah which emphasizes how we must trust in Hashem alone. "Cursed is the man who trusts in man and relies on mortal flesh for his strength, and whose heart turns away from G-d… Blessed is the man who trusts in the G-d, to whom G-d will be his trust. For he shall be like a tree planted by the water, and which spreads its roots out into a stream…" (Yirmeyahu 17:5-8). On Yom Yerushalayim, people's belief in G-d became awakened through the great wonders which they saw with their own eyes. They danced in the streets, and many returned to G-d and His Torah. Soldiers testified that they actually saw the hand of Hashem in the battle field, and ran to purchase books of Tehillim (psalms). Everyone was talking about the miracles, which became a sign to await and prepare for the final redemption. It is no wonder that the Ba'al Teshuvah movement emerged at this very time. Both Israeli and Jews from all over the world returned to Torah, inspired by the uplifted spirit which followed the Six Day War. However, it takes a conscious effort to relive the experience of the miracles. It is a natural phenomenon to forget the great wonders which Hashem wrought for us and their messages. After the years have passed, we all tend to forget "that which our eyes saw." Thus explains Rabbi Simcha Bunim in his book Kol Simcha, "All the plagues and the splitting of the sea were miraculous, but when Israel sinned, the world returned to the way of nature. They forgot the experience of the miracles. Only a vague remembrance remained. The Chafetz Chaim held that our time is without any doubt the time of the footsteps of Mashiach. The signs which chazal (our sages) gave us are all being fulfilled. However, revealed miracles only happen to those who take them to heart. The manna which Israel ate in the wilderness had many different tastes according to the imagination of each person at the time of eating (Babylonian Talmud, Yoma 75a). Yet, how did the manna taste to someone who didn't contemplate anything while eating it? The Chafetz Chaim explains that this person wouldn't taste anything at all when he ate the bread of Heaven. The value of any spiritual lesson is only recognized by those who contemplate upon it. This principle also applies to the coming of Mashiach. The experience of how the whole world will be filled with the revelation of the Shechinah and with knowledge of Hashem, is dependent on how much we contemplate and open our heart. If we don't think about the coming of Mashiach, we won't feel it at all. In my early teshuvah process, I was surrounded by people who didn't make much out of Yom Ha'atzmaut and Yom Yerushalayim. It seems to me that politics has taken over and blurred the desire for truth. We Jews are polarized into those who are for, and those who are against. Rather than striving to find the Torah way of celebrating these great events, it became a question of with which group do you identify. Those belonging to the Zionistic camp celebrate according to the Rabbinate of Israel. Those in the Chareidi box, although they learn Torah day and night and endeavor to mold their every step to the will of G-d, unfortunately identify themselves as being against anything the Rabbinate of Israel decides, including the celebration of Yom Ha'atzmaut and Yom Yerushalayim. No one ever asked Rabbi Moshe Feinstein a sha'alah whether to say hallel on these days. Since the importance of praising Hashem for His miracles is well known, we cannot take this question lightly. "Had Chezkiyahu recited song at the downfall of Sancheriv, he would have become the King Mashiach…" (Babylonian Talmud, Sanhedrin 94a). In my search for the true Torah perspective on celebrating these miraculous events of our modern history, I came upon a book by Rabbi Menachem Kasher written right after the Six Day War, called "Hatekufah HaGedolah" (The Great Period.) He quotes the Meiri on Pesachim 117 who writes: "Every individual who was saved from tragedy is permitted to say hallel for himself on this day every year, but he doesn't recite the blessing. This is the law for every community, and thus it was established by the prophets to say hallel when redeemed from any distress." How much more so, should we celebrate in song, when we witness with our own eyes the prophecies of redemption being fulfilled. The chesed of Hashem, has caused us to emerge victorious against the enemies who plotted our annihilation, and caused us to be reunited with our Holy City Jerusalem. May we see the rebuilding of its glorious Temple speedily in our days! Our haftorah culminates with a prayer for healing. "Heal me, O Hashem, then I shall be healed; help me, then I shall be helped, for You are my praise! (Yirmeyahu 17:14).May Hashem heal the rift between the different camps of Israel so that we can praise Him together in complete unity! I would love to hear your thoughts and answer any questions! Thank you for your beautiful and profound insights. I am a Noahide who has a heart to see the Jewish people fulfill their destiny. Of course, seeing so many American Jews seemingly lost in secularism or liberalism, I have been asking myself and Hashem, how do I pray for them. I will incorporate your closing words in my prayers. I will also be pondering and digesting your words about "the value of a spiritual lesson is only recognized by those who contemplate upon it" and being open to revealed miracles. Thank you for being such a beautiful, free-flowing vessel for Hashem's Light. What a great teaching, Rebbitzen! I really appreciate the way you connect what is happening today with the HafTorah and/or Torah portion. It shows us how the Torah is living and Hashem is so very present in our lives and world, to what ever degree we contemplate HIM.